While typical, honest, graphics show progress toward a goal in a linear fashion, Xcel took a different approach. Things start out fine with their 2004 stats. 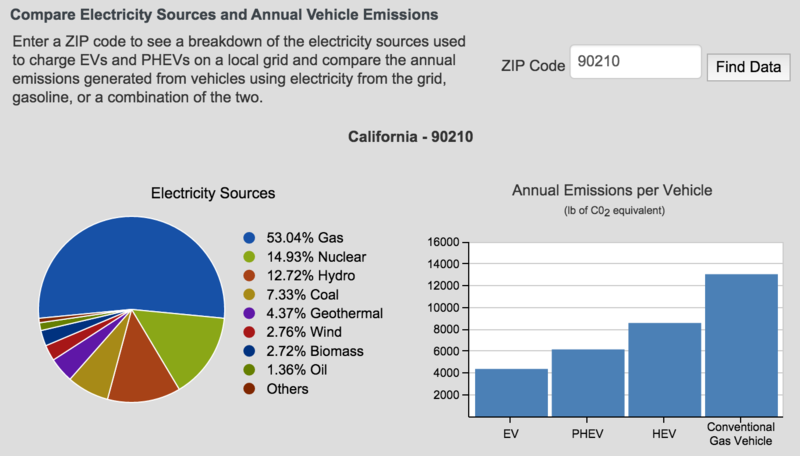 But, when they added 2005 stats, they included the 2004 data with the 2005 data (the yellow line). 2006’s data includes the two previous years (turquoise line). By 2012, they were taking credit for every previous year within that one year. Taking credit for 2004’s consumption in 2005 – 2012 is rather ridiculous. If they want to stack each year of data, they shouldn’t do so redundantly. Here’s a stacked version where each year is only counted once. The early years on the left had lower consumption on the left, but in aggregate they reached the 1 billion kWh milestone. 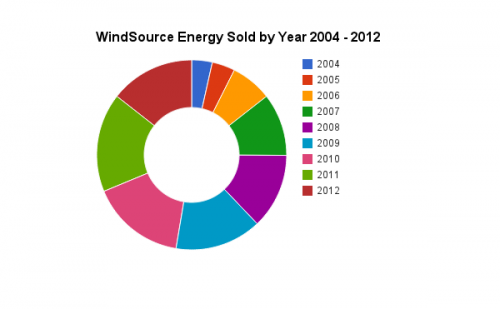 Is Windsource slipping in popularity? I don’t know. 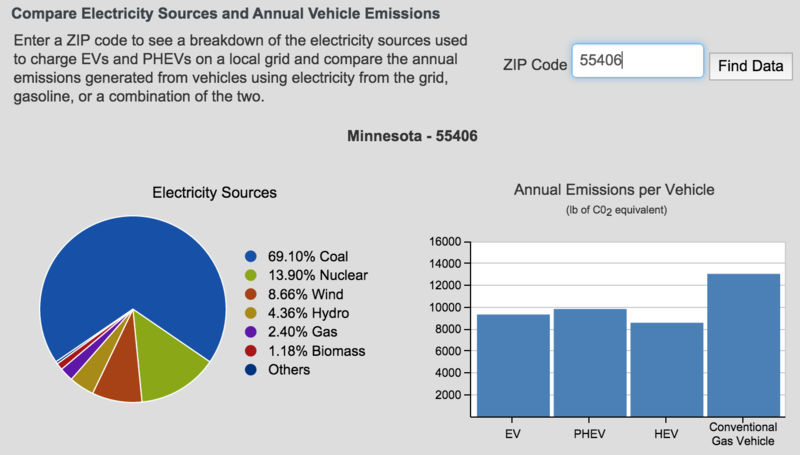 I’m assuming that the 2012 data includes the full year of 2012 since Xcel waited until April 2013 to put out a press release about the milestone. But, the more important issue to me is Xcel’s knack for misleading customers about their practices. 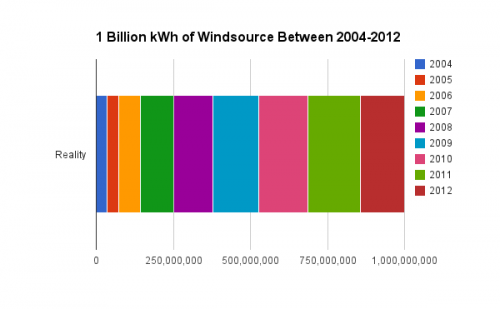 Their Windsource chart is one example of this. 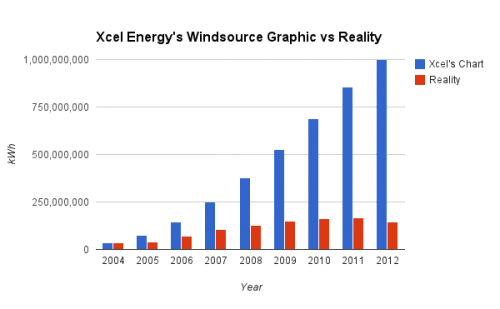 In this case, the volume of lines illustrating Windsource consumption between 2004 – 2012 in the Xcel’s chart create the impression that they sold 4X the volume of kWh they actually sold. 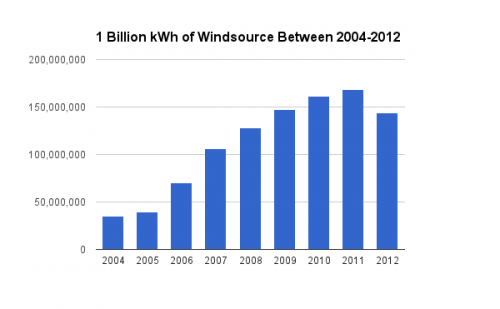 The line for 2012 distorts their 2012 Windsource sales by nearly 7X. I’m an Xcel customer and a Windsource customer. As a Minneapolis resident, I don’t have many energy options. But, even without options, I shouldn’t have to deal with a utility that so blatantly misleads the public about their renewable milestones. David Shaffer has a story in the StarTribune about Xcel’s proposed rate increases. It sounds like Xcel wanted to increase rates by 10.7%, but it’s going to end up somewhere closer to 5%. The judge also concluded that Xcel shouldn’t be allowed to immediately bill ratepayers for some of the escalating costs associated with upgrading Xcel’s 42-year-old Monticello nuclear power plant or its expenses related to a catastrophic 2011 accident at its giant coal-burning plant in Becker, Minn. If the cost of dirty power is increasing, shouldn’t those who choose to use dirty power feel that pain? In addition to the long term costs to the air we breath, there are real costs to maintaining carbon belching and nuclear waste generating plants. 69 cents over a month. 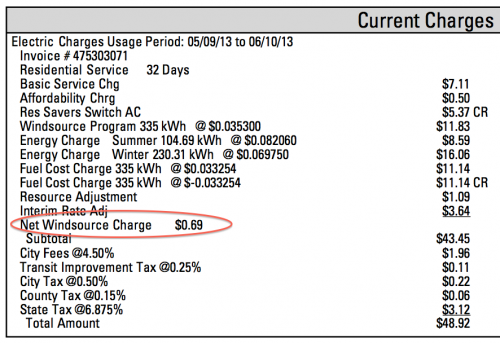 After taxes on that net 69, I paid around 77 cents extra to rely upon wind over dirty power. That’s not breaking the bank. And, you know what would close that gap even further? Letting Xcel charge dirty power users for the costs of maintaining their dirty power plants. Eventually, that WindSource net energy cost could go negative, and that’s when people who don’t care enough about the air we breath to pay an extra 1.6% for power will go green based solely on cost. 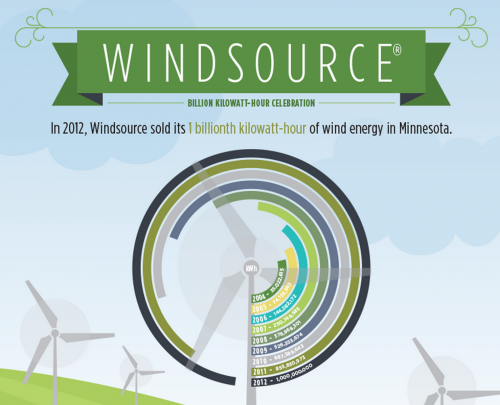 Where Does Xcel Energy’s Wind Power Come From? Ranty mentioned that The Healy House is now wind powered, as in, the power purchased from Xcel Energy comes from wind sources. It’s a very simple process. Just call Xcel, work your way through their phone tree until you reach a human (that’s the toughest part), then tell them you’d like to join the WindSource program. Done. You’ll be charged slightly more per month for wind power. In exchange, you’ll cut down on burning crap that gives kids asthma. Xcel Energy is also building a wind farm near Austin, MN. Author Ed KohlerPosted on February 24, 2008 September 4, 2018 Categories Xcel Energy4 Comments on Where Does Xcel Energy’s Wind Power Come From? For those of you who follow shoefiti as closely as I do (LOL) it should come as no surprise to hear that Newark, New Jersey has a shoefiti problem on their hands. What counts most is how the community feels about the shoes. “If the perception is people associate it with blight, it’s got to come down because people will feel less safe,” said Kohler. One of the biggest challenges I’ve faced with getting shoes removed from powerlines locally has been dealing with Xcel Energy. As I understand it, they have a policy of “driver’s discretion” for dealing with items on powerlines that aren’t interfering with power. While that’s understandable, they way it’s applied is to remove shoes from lines in the nicer areas of Minneapolis while leaving them up in the tougher neighborhoods, thus inadvertently contributing to the blight of areas that need the most help. Verizon doesn’t take the shoe issue as seriously as Waldrop. Rich Young, a spokesman, said the shoes are taken down if they are causing problems with the network, if they get a complaint or if a technician just happens to be working near an airborne pair. The old, “Sure, they’re our lines, but we’re not responsible for them.” routine. Flaming Power Outage in Longfellow, originally uploaded by edkohler. The power went out around 10 minutes ago in Longfellow, so Carly and I set down our laptops and went for a walk to investigate. 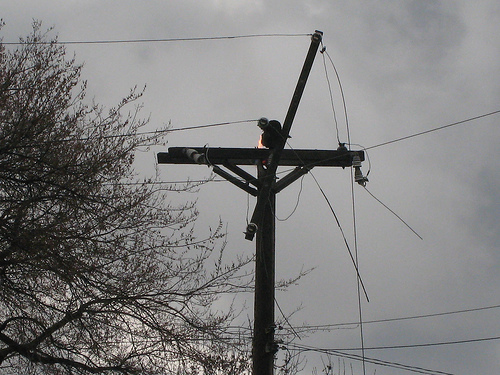 We think this flaming phone pole at 32nd St E & 45th Ave S might have something to do with it. Mary, the automated response lady at Xcel Energy, says power will be out for 4 hours. Carly said, “I don’t have four hours!” in response, so I guess she’s coffee shop bound in another neighborhood. I got shushed along by a member of the MFD after snapping this exclusive footage for The Deets. If it blows up it leads on The Deets.